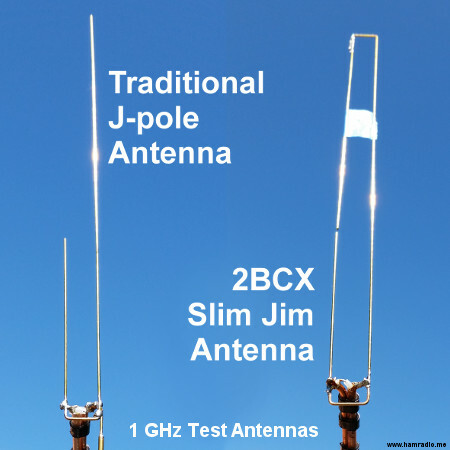 Does the 2BCX Slim Jim antenna live up to the oft touted more gain or better takeoff angle over a traditional j-pole? “Slim Jim” – What does the name mean? All J-poles are slim. All J-poles have an integrated matching stub. This description aptly describes the traditional J-pole antenna quite well. 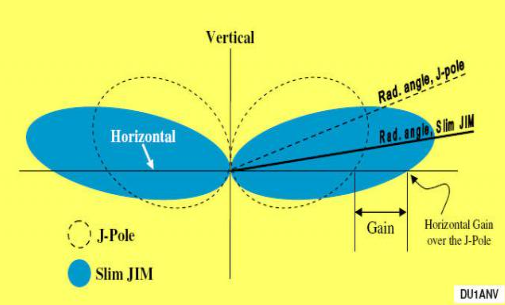 If the JIM moniker describes the 1/4 wave stub inherent in every J-pole antenna, one can argue the term “Slim Jim” describes J-pole antennas as they have been since or before 1936. Slim Jim, by his definition, is any half-wave dipole antenna fed with a quarter-wave stub with the feedline across a portion of the stub to find an optimal impedance – this includes the traditional J-pole, Zepp, etc. 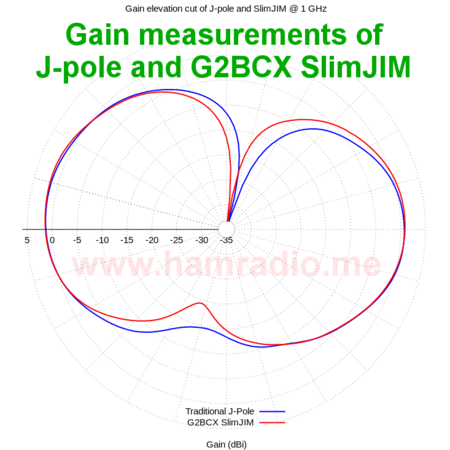 2BCX Slim Jim is the proper name for the j-pole antenna using a folded dipole as the half-wave radiator. Yes that’s right… real antenna measurements of each antenna in a real test chamber will help us understand the behavior of the J-pole and 2BCX Slim Jim antennas. Judd used 650 MHz models in his comparison between his 2BCX Slim Jim and a 5/8 wave antennas. I compared his design to a traditional J-pole – a more apples to apples comparison. My models are proportioned for 1 GHz and made with 0.8 mm wire. In both my models, I feed the quarter wave stub with a Folded Balun (aka Pawsey Stub) with orientation perpendicular to the antenna such that any small radiation from the feed won’t add to the polarization shown in the graph below. 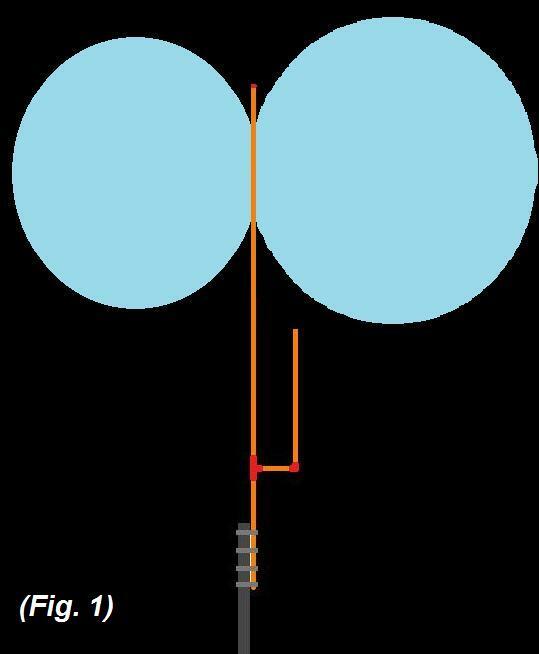 Let’s have a look at an elevation cut of the traditional J-pole and the 2BCX Slim Jim antennas – note the open J stub faces left for both antennas. Taking into account the +/- 1 dB margin of error in typical antenna chambers, we in the antenna biz call these two patterns: identical for all practical purposes. 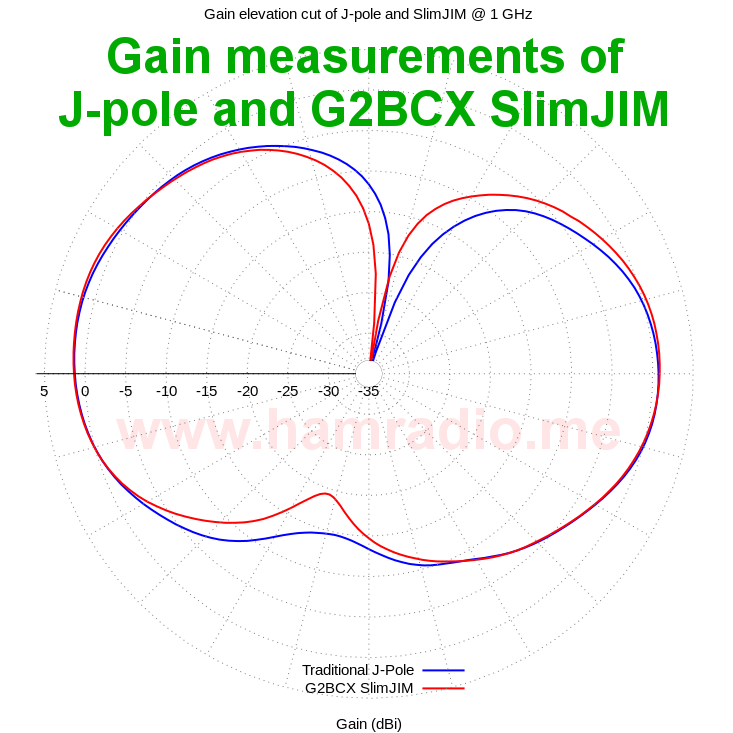 Simulations reveal the 2BCX Slim Jim has never operated different than a traditional j-pole antenna. To check this more thoroughly I ran these four configurations in NEC to see the differences. Cebik did this analysis as well in his extensive body of antenna work, but those results are no longer freely available on the Internet. It took less than an hour to repeat the analysis using 4nec2. 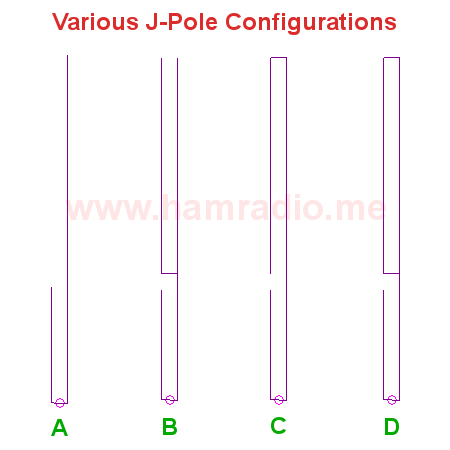 Figure 3A – Traditional J antenna. Figure 3B – One element in parallel with the upper half-wave element and connecting at the bottom. Figure 3C – The 2BCX Slim Jim with one element parallel with the upper half-wave element and connecting at the top. Figure 3D – One element in parallel with the upper half-wave element and connecting at both top and bottom. These agree well with the real j-pole and 2BCX antennas measured in a real antenna test chamber in figure 2. At this point it’s pretty crystal clear Fred Judd’s 2BCX Slim Jim antenna doesn’t offer anything special compared to a traditional J-pole antenna. With all ground plane aerials, including those with radials of more than 1/2 inch length, radiation is tilted to an average angle of 30 [degrees] or more. Interestingly, simulations of the above monopole with radials do not reveal the elevated angle of radiation, rather it shows the textbook doughnut shape. However, by adding the effect of the feedline to the monopole with radials, the simulation agrees with the above measurements. Feedlines… gotta love em… gotta hate em. Note the monopole angle of radiation increase, while obvious, isn’t tragic. However, the J-pole antenna shows a slight beneficial angle of radiation because, in my opinion, J-pole users are well taught to address feedline radiation with a choke. [. . .] the Slim-JIM has no reason to work any better than a dipole, standard J-pole, or a quarter wave ground plane with sloping radials. Any variations measured among them will more likely be to differences in common mode current, to which they are all susceptible. Anyway… somewhere, somehow Judd’s published comparison morphed (likely via Chinese Whispers) from “Slim Jim & 5/8 wave” to “Slim Jim and J-pole.” The later has been copied many times on the Internet – here is one example – [UPDATE: now a dead link – click here for archive]. This has become a classic example of why the phrase “It’s on the Internet so it must be true” is bogus. dB?!? Sigh. Ignoring the lack of using dBi for the moment, the numbers reveal the 2BCX Slim Jim outperforms the J-pole in “directivity” by 4.8% and “gain” by a whopping 6.7% or about 0.2 dB difference – 1/5th dB?!? Yee Haw! The unreported margin of error is likely +/- more than 1/5 dB; It’s certainly not +/- .0001 dB as the data presentation might have you believe. I have seen this slight increase in some of my NEC models as well, but come on, differences this low are essentially imperceptible in the real world unless you’re in the “every dB is sacred” EME fraternity. Additionally Figures 14 and 20 in their paper give the takeoff angle advantage ever so slightly to the J-pole. I applaud the students for their paper confirming the J-Pole and Slim Jim have essentially the same gain and similar performance. At least their work provides another simulation confirmation (HFSS in this case) the Slim Jim DOES NOT have 3-6 dB more gain than a J-pole as some web sites advocate. J-pole users know feedline choking is important – they may not know why, but most follow this rule so the feedline doesn’t spoil the antenna pattern. Good. J-pole users are wildly confused about whether to ground it or not thanks, in part, to contradictory statements in the literature. Some literature mandates the J-pole must be grounded to a mast to function as an antenna: OMG. Bad. Slim Jim users know feedline choking is important – they may not know why, but most follow this rule so the feedline doesn’t spoil the antenna pattern. Good. Slim Jim users know mast currents are a problem – they may not know why, but most follow the rule to isolate the structure of the Slim Jim from the mount to avoid mast currents. Good. The above points about Slim Jim users suggest, in my opinion, they have better installation instructions that should apply to all J-pole antennas. Feedline and mast currents can spoil any antenna’s pattern rather dramatically. Readers of this blog know all too well my trumpeting of mast current concerns here, here and here. Neither antenna will operate correctly if mast currents remain unchecked. It’s not a stretch to suggest Slim Jim users have the advantage merely because the various Slim Jim instructions address mast currents along with feedline currents whereas J-pole users often only properly address feedline currents. All the above suggests casual observers, and even those in academia, may not know better or draw desired conclusions contrary to their own data. You manufacturers, however, need to step up to a higher standard of quality control and vet the designs you sell. For you copper pipe 2BCX Slim Jim manufacturers out there claiming a gain over a traditional j-pole, isn’t it time you quit revealing to the planet your obvious lack of antenna design capability? It’s well worth your while to research the product you sell. If you want to manufacturer an antenna that uses more materials than a traditional J-pole with no measurable benefit, fine, but don’t mislead your customers about nonexistent gain advantages. This admonition does not apply to manufacturers of roll-up ladder-line variants of the 2BCX Slim Jim since the extra conductor is there anyway so connecting at the top (or bottom or both) adds little cost. The Slim Jim and J-Pole have different take off angles (evidence clearly shows otherwise). These are a pretty good pass/fail litmus test of functional antenna knowledge. Some of the available products and designs have sound mechanical design, superb price point, and for as much as they have successfully rendered the classic designs, functionality as a good basic antenna. You may decide to purchase their product or make their design, but you can now do so with realistic expectations – not gain hype. I suspect your biggest benefit will derive from properly addressing common mode currents on the mount and feedline because this is an easy way to ruin any otherwise functional antenna. Any antenna manufacturer stating gain as simply dB without a relational qualifier are stating nothing really. Professionals state gain in dBi and only in freespace. Some non-professionals state gain in dBd, but this hasn’t been convention in professional antenna engineering for quite some time. Fortunately the relationship between the two is dBi = dBd + 2.15 so given one, the other may be accurately derived. If you want to look like you know what you are talking about, use only freespace gain given in dBi for non-ground-mounted antennas. Antenna manufacturers sometimes state gain over ground (often to inflate gain claims), but the variables of height, ground conductivity and dielectric properties are too varied to provide a consistent measurement. 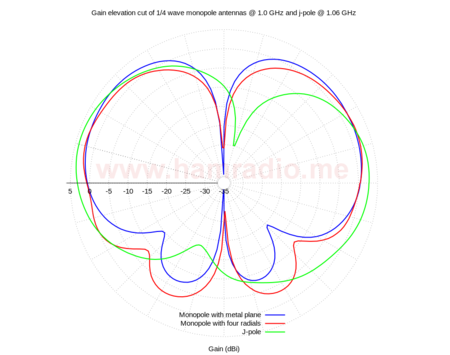 Gain in freespace is the only universal way to compare antennas. That said, it is very important to understand how an antenna will behave in a particular installation, over the local ground, on a case by case basis. This is an important part of a site study, not a way to compare antenna behavior. Both freespace gain and site-specific gain are important… just don’t confuse the two. With few exceptions, be critical of antenna manufacturers that don’t publish freespace simulations or chamber measurements of their products. Most “SWR Only” manufacturers, have stellar intent, but are running blind as to actual antenna behavior; There are some who seem to have “the knack,” but these are exceptions. Question: What’s worse than no antenna patterns for an antenna product? 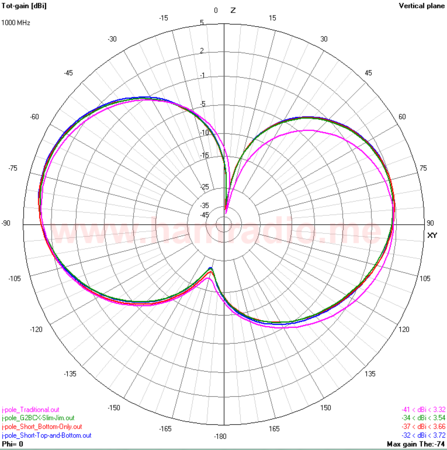 Answer: Hand drawn antenna patterns for an antenna product. If any antenna web site, but especially manufacturer’s sites, generate antenna patterns by hand (using a computer drawing package for example), know they are expressing what they “think” or “expect” an antenna pattern to be, not necessarily what the pattern is – Hurl. My watch says this is the 21st century. Unless you’re Lindenblad or Hoverman’s ghost, the practically free NEC tools and other not so free FDTD, etc. tools are the only acceptable methods to critique an antenna’s performance. The college students mentioned above use simulation… so should a manufacturer. Sure these tools have their quirks, but there are just too many variables to track. These tools track them all effortlessly. So… if you visit a web site and an antenna pattern reminds you of the colorform fun of your youth, or looks like this, or this, the chances of sufficient technical literacy in the surrounding text are questionable. Move on. Just say no to juvenile antenna analysis. Various simulation methods agree with each other – NEC (both EzNEC and 4nec2), HFSS (from the college paper) and FDTD all produce the same basic pattern for the J and Slim Jim – about 2-3 dBi. Perceived benefit likely mast current mitigation – It’s very easy to reduce j-pole performance simply by connecting it to a long mast. The general advice to RF isolate a 2BCX Slim Jim from its mount is superb advice for any j-pole and is a likely reason for observed improvement. The exceptionally handy role-up ladder-line examples aside, the copper pipe 2BCX Slim Jim antenna uses more materials to accomplish the same thing as a J-pole. Why bother. You’re better off using the extra copper pipe as a mast decoupling stub in the Mast Mountable J-Pole Antenna. As seen above, both the Slim Jim and traditional J-Pole antennas provide a measurable benefit to dipoles and monopole antennas using radials. The J-pole and the Slim Jim achieve similar performance. Can we put this Slim Jim gain myth to rest please? I’ve spent a good amount of time and effort to prove to myself the Slim Jim is really just a folded dipole with freespace patterns very similar or practically the same as a regular J antenna. I’ve shared the results with you in the figures above. If you have chamber measurements or a NEC model that shows the Slim Jim has a freespace gain well beyond 3 dBi, the readers of this web site would love to see it. I will gladly share such results with the readers if you send me the report and/or model. Laurance McConnell Leeds, “Antenna System“, US Patent 2,124,424, 1936. Spotts, Pete. “An Emerging Challenge to Science’s Credibility.” The Christian Science Monitor 28 Aug. 2015. Web. 28 Aug. 2015. 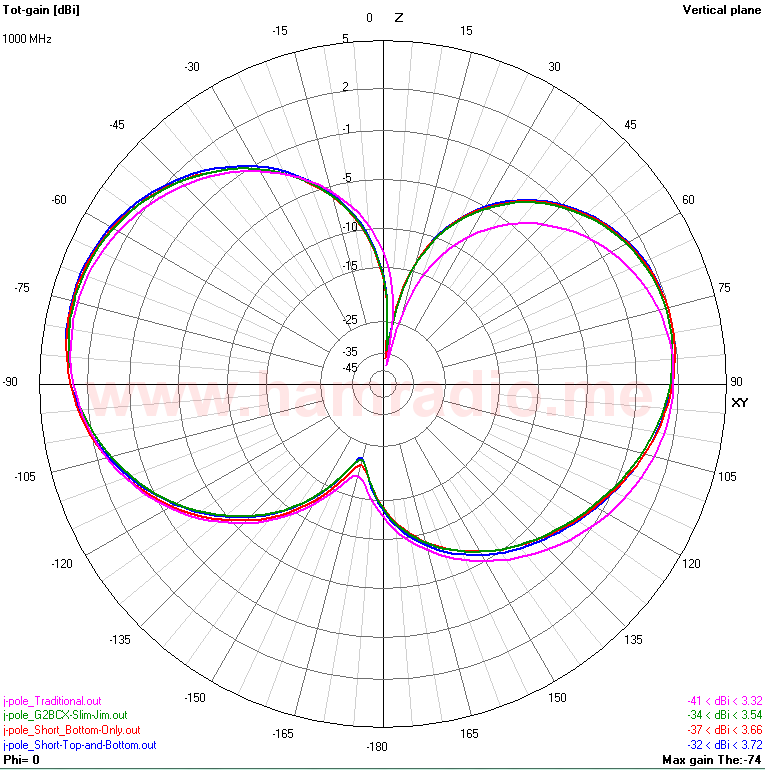 Do you have any suggestions for a good choke design for use with a 70cm J-Pole or slim Jim antenna? Ferrite solutions depend on availability of ferrite material that might not be available because the frequency is so high. If you can find such material that works at UHF, a ferrite choke is the simplest approach. The classic spooling coax into bundle does have merit and does help a bit. The interwinding capacitance is likely going to be a problem a limit effectiveness. For me, it was like this….I could easily hang a slim-jim by tying a rope to the top and hoisting it up. You cannot hang a j-pole in the same manner. As far as a waste of copper; that's debatable; you can build a Slim Jim with a 10ft section of copper pipe; which is usually how you buy it in the store. Unless you've got a specific use for a foot or two of pipe…it almost seems wasteful to not use it on the antenna. Fair enough. Your points are well taken. If the extra copper provides a mechanical benefit that's great. The key takeaway from my findings is it provides no electrical benefit… nor degradation. I'm late to the party. Excellent article, thanks for all the info! I'm curious if there is any benefit to the extra copper on the receiving end of things? Seems like a physically larger antenna would catch more signal, but perhaps it's the same negligible difference in the real world? The conductors in the SlimJim, while in phase, are much too close to each other to be anything more than a slightly fatter single conductor. The parallel conductors work just like a folded dipole in almost every way. There is a serious omission amongst all this analysis . Bandwidth ! 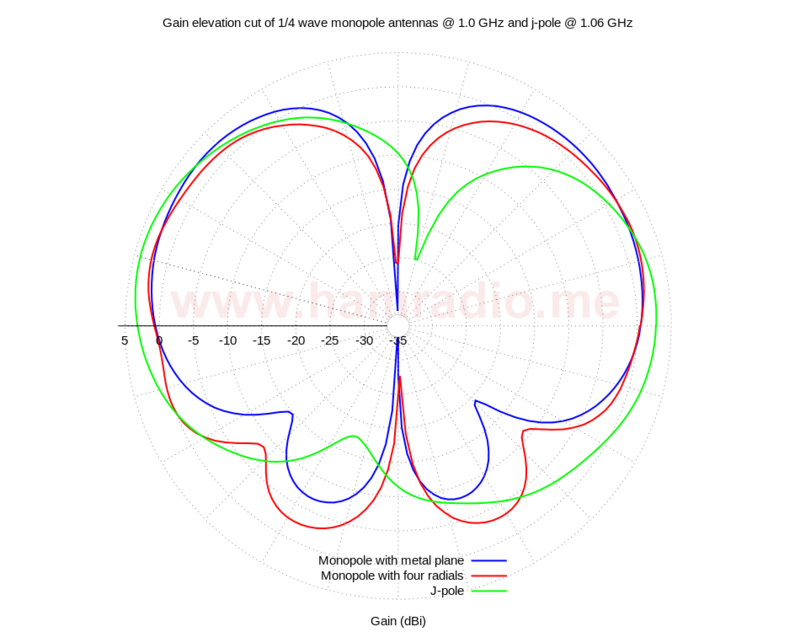 one of the most important antenna parameters . I have not made any measurements but I suggest the slim jim standard configuration will exhibit a wider bandwidth with acceptable matching than the j pole . I have used a j pole design for many low power special events broadcasts (VHF 87 MHz) when it equals any end fed dipole design . I found the most successful matching technique to be with a coax balun 1:4 when all feeder interaction is eliminated , the antenna mounted on grp pole with feeder enclosed . This arrangement seems in practice to produce very low take off angles & when used as a receiving antenna distant stations are at highest field strength with antenna completely vertical . ie. no tilt . Hi Russ. Good point on the bandwidth. I did measure it and it wasn't much different, but was certainly noticeable. I will dig around for the data. I tried to explain to a newly licensed Amateur that the Slim Jims secret was in its low angle of radiation rather than the published gain figures. I made no impression on the newly licensed Amateur's opinion as the Slim Jims gain figures were published on the manufacturers site, so, he thinks they must be correct. An excellent article I enjoyed it, I am now making a Slim Jim for 70mhz. Sadly a great many makers of the Slim Jim lack the qualifications to quote antenna specifications. I an a new ham KN4GWC, so pardon my naiveté'. Does a J-pole or Slimjim primarily radiate on lobes perpendicular to the plane of the feed loop, or parallel to it? Excellent question. The azimuth gain around the waste of the antenna is almost perfectly uniform varying only a dB or two. It favors the direction on the side with the J stub in the plane of the J. The gain opposite and away from the stub is the lowest. The gain perpendicular to the plane of the stub is equal in both directions and is a value between the previously mentioned max and min values. Being only a dB or two apart, the difference is measurable, but hardly noticeable in practical use. For all practical purposes, it is an omnidirectional antenna. Thank you – the current 2m setup is with a slimjim in my attic 20 feet up; with 80 watts – it gives access to repeaters 40-50 miles away. QTH is in SE Florida where most of the population is in 20 mile strips on each of the two coasts. Is there a vhf antenna that can be oriented to focus north and south, where radiation to east and west would be wasted on ocean and alligators? In theory yes. It might be as simple as arranging two J antennas appropriately and feeding them with a splitter. There are several ways of accomplishing this. Let me put some thought into it. Which SlimJim antenna (make/model/design) are you using? My Slimjim Made by KB9VBR – decision was based more on space than anything. Had only 59 inches of vertical space.-AND – it cost about the same as materials and time alone. Feeding it with a Yaesu 2980 via 25 feet of LMR-400 Coax. VSWR is <1.1. Eventually want to put it outside and the 0.5 inch copper pipe is highly resistant to Florida's "fall winds". why dont you take a look at the inflated gain figures for most american made tri-banders. talk about being economical with the truth. home-brewing antennas was quite popular in the uk, and its satisfying to make an antenna that performs as good as a commercial antenna. i have read quite a few of fred judds articles on antennas, and he did know a thing or two. maybe you should try using your ham equipment on air, instead of disparaging people who are trying to help others make simple antennas to get started in their ham hobby. this "review" kinda reminds me of the old brigade who would not talk to newly licensed amateurs simply because they did not know code! there are elitists in every hobby, but you have to remind yourself, it is a hobby! "why dont you take a look at the inflated gain figures for most american made tri-banders. ."
Gainflation is a problem with many antenna manufacturers, be they semi-professional or amateur – This is true. Have I said otherwise? "talk about being economical with the truth"
Just being truthful with the truth. "i have read quite a few of fred judds articles on antennas, and he did know a thing or two." As have I. I agree he is quite knowledgeable. I've never said otherwise. "maybe you should try using your ham equipment on air,"
" instead of disparaging people who are trying to help others make simple antennas to get started in their ham hobby. " Have I discouraged anyone from making their own antennas… including the SlimJim? If you think I disparaged Fred Judd then you have completely missed the point of the article. Re-read it to understand Judd's article stands the test of time. It is his choice of reference antenna that has confused so many. If you are not one who believes the SlimJim has magical gain over a regular J, good for you. 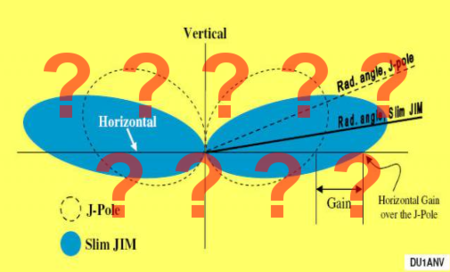 If, however, you are one who believes the SlimJim merits a significant gain figure beyond that of a regular J or dipole, you have not paid attention to Judd's own article and have simply followed the herd over the cliff of reality. Reinforcing this lie does no one, especially beginners, any good. Excellent article, thank you. In the '80s and '90s I made quite a few antennae from Fred Judd designed and even spoke to him a few times. His dual folded dipole Yagi (I know that sounds crazy) was a very useful beam on 2m. I wish I still had all his designs! Does the slim Jim have lower takeoff angles vs j-pole as many state which can attribute to more received energy at distances vs in a test box? Also, does the comparison change for 2m or 70cm as all the data was obtained at higher frequencies, e.g. 650mhz and 1ghz. "Does the slim Jim have lower takeoff angles vs j-pole as many state which can attribute to more received energy at distances vs in a test box?" No. Refer to figures 1 and 2 above. "Also, does the comparison change for 2m or 70cm as all the data was obtained at higher frequencies, e.g. 650mhz and 1ghz." So long as the antennas are built in proportion to the wavelength of the desired frequency, they result in practically identical patterns. Often the mounting structure and feedline perturb the resulting pattern greatly highlighting the need to mitigate rouge currents, but when you control for them, the patterns match. In regards to my question about take-off angle, I should've elaborated with the two antennas suspended above the ground like have been simulated in other comparisons, e.g. 6ft 15ft and 30ft elevations. Was curious if the ground affected the lobes. Thanks for all you work! Yes the grounds do have a profound effect on the real-world lobes from the antenna based on, more or less, the height of the antenna's center of radiation above the ground. In this example both the slimjim and traditional J have practically identical free space radiation so both will interact with the ground the same way. Generally the higher they are the more compressed the lowest radiation lobe. That makes sense, I started thinking that after I replied above again. Thanks for all your work, really helps me learn! For the slim jim, I'm wondering about a build-variation for the upper short: Using 1/2" copper pipe, I might try a centered, 90-degree elbow, immediately attached to two 45's, to make an inverted "V-end" (a "^-end") on the top. I'm thinking this more "graduated" electrical transition (from the parallel section) might provide an ever-so-slightly "better" short, while also providing a centered (i.e., gravitationally balanced) support-point, for a hauling-up line (like over a tree-branch). Visually aesthetic, too. At the bottom, unfortunately, I don't find any "270-45-135" copper wyes available), but one might use a tee or a cross, for symmetry there (although it pushes the parallel stub out a bit farther away). One could do the same on a lower, high-Z isolation stub. Any thoughts? Great article and timely too, Build several SLIM JIM's over the years starting in the 1970's and whilst none of this article is news to me it does seem that a lot of misconception has crept in over the years. Fake News would be the operative word for the information that seems to surround this useful antenna. My main reason for building the Slim Jim has always been because of slight benifits when it comes to band width and also the very easy matching stub method. My first slim jim that I built was for use on 11 and 10 meter bands and it performed superbly though a little bit of a construction nightmare at these frequencies. I had always thought (and still do) that SLIM stands for Stub line intergrated matching. Once again thanks for blowing away the fog that seems to surround this radiator. 1. I have a lot of copper pipe lying around from a plumbing refurb, so if I can gain any benefit from the slim jim, it's the best alternative. 2. If my calculation is right, even 1dB is about 25% performance improvement: I'll take that. 3. The azimuth chart ought to compare at either's maximum elevation lobe, did you adjust the angle independently for that? Just curious, because if you didn't I would expect that would mask any gain. 4. I did not check, but another stated advantage is the SWR bandwidth, did you address that?